When people think of wolves, one species usually comes to mind: the gray wolf. The gray wolf is the largest wolf and the basis of legends. According to National Geographic, the breed was almost hunted to extinction in the lower 48 states of the United States. Even now, few exist outside Alaska. According to the National Wildlife Federation, the female gray wolves weigh 60 to 100 pounds, while males weigh 70 to 145 pounds. With larger wolves of this species weighing the same as the average adult human male, it's easy to see that these are big wolves. From head to tail, the adult gray wolf measures 36 to 63 inches. This makes the gray wolf a top predator for taking down smaller mammals individually, such as rabbits and beavers, as well as in pack to take down a full-grown deer, elk or moose. The gray wolf has a life span of six to eight years and usually runs in packs of six to 10 animals. Wolves are known to roam up to 12 miles away from the den in a day. An individual can consume up to 20 pounds in a sitting. 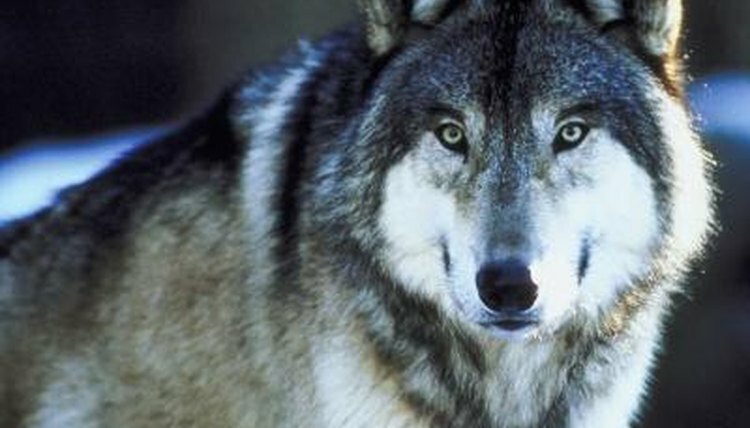 The gray wolf no longer has a strong presence in the continental United States. A few gray wolves live in the Great Lakes area and Yellowstone, but most are found in Alaska. Less than 1,000 gray wolves live in Yellowstone. Gray wolves are often found in forest areas where game, such as deer, are abundant and where dens can be prepared for cubs; but the species can thrive in diverse climates. The gray wolf can be found in tundra, desert and even grassland habitats. In Alaska, where hunting of the gray wolf is legal, roughly 7,000 to 11,000 gray wolves exist. In Canada, where the species is also considered game, roughly 50,000 exist. The reason hunting is allowed despite the species' low population is because it's feared that, if gray wolves were allowed to breed without being hunted, the numbers would increase dramatically and the population would become a danger to life stock and humans. Because of their large size, the gray wolf has been the basis of legend for hundreds of years. When people think of werewolves, they usually think of the characteristics seen in gray wolves. Their large size, hunting of domestic animals and piercing howl are a traditional fright feature at Halloween. Even the notion that a wolf might be lurking at the moonlit wood's shaded edge is enough to strike fear in the faint hearts of many humans.